On August 15, The IBKC Blog will be celebrating it's 2 year anniversary. In honor of this occasion, I thought we could take a trip down memory lane and re-visit a few posts from the early days. Our first link to the past, is a Pettibone post. The day the Pettibones moved in was a magical one. It took them just a few seconds to adjust to their new surroundings. Never before, or since, have we had a litter settle so quickly. Here's a picture from their very first day. You can read the complete post by clicking here. It is funny you should choose the Pettibones first, because Gaetano reminds me so much of Renatta. I think what also makes the Pettibones memorable is that we can still follow several of them in their own blogs. And weren't they also the first ones to get postcards? oh my goodness! i didn't notice until i read the original post that they're piled up on top of a body! i'm sure it was a dead body at that point, because how could someone not just DIE from the adorableness of it?? Who needs a hot rock treatment when you can have a warm kitten treatment? such sweetness.....they conquered the human and made a human puddle! It's nothing short of a WONDER, how you can accomplish ANYthing with all those around; I'd have them gathered all up in my lap and NEVER get offa the couch. And -- yeah, what they all said too! This won't surprise anyone who knows how much the Pettibone's have enriched my life. I just cried seeing them so fragile, trusting and vulnerable. Thank God the IKBC and many others care so deeply for the "wee ones" who need a helping hand. This world can be cold and lonely. The Pettibone's and IKBC prove it doesn't have to be! WHO are they perching on? Agnes and Henry (Carmine) have completed my little family. They are hilarious and super sweet! I will be forever grateful to Laurie and Ms. Butterbean for caring for them and bringing them into our lives. What a gorgeous half dozen kittehs! 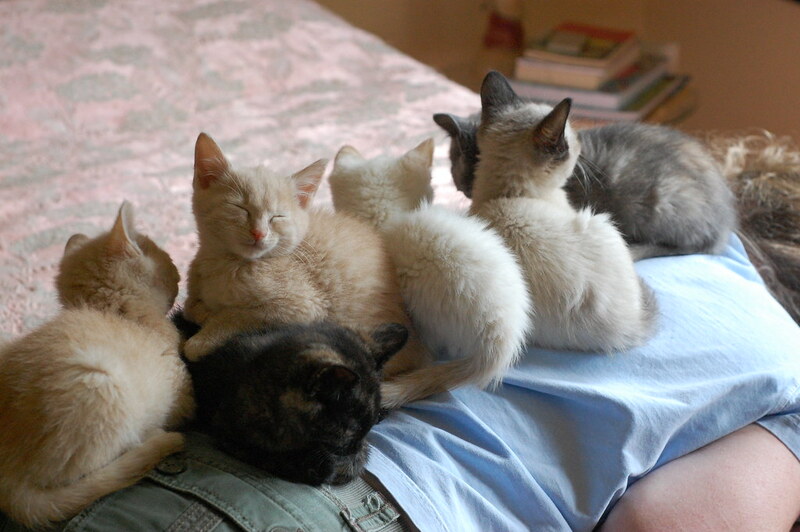 I love that they are all falling asleep on someone's back. I bet they are such lovebugs growing up. I have a special place in my heart for this litter, as this was one of the first groups I got to follow from beginning to bittersweet end. Then, as now... :thunk: The Pettibones just smote me! *sigh* As I said on the Wendell post... it seems like just yesterday! I even remember some of the comments!